It’s been too long, friends. 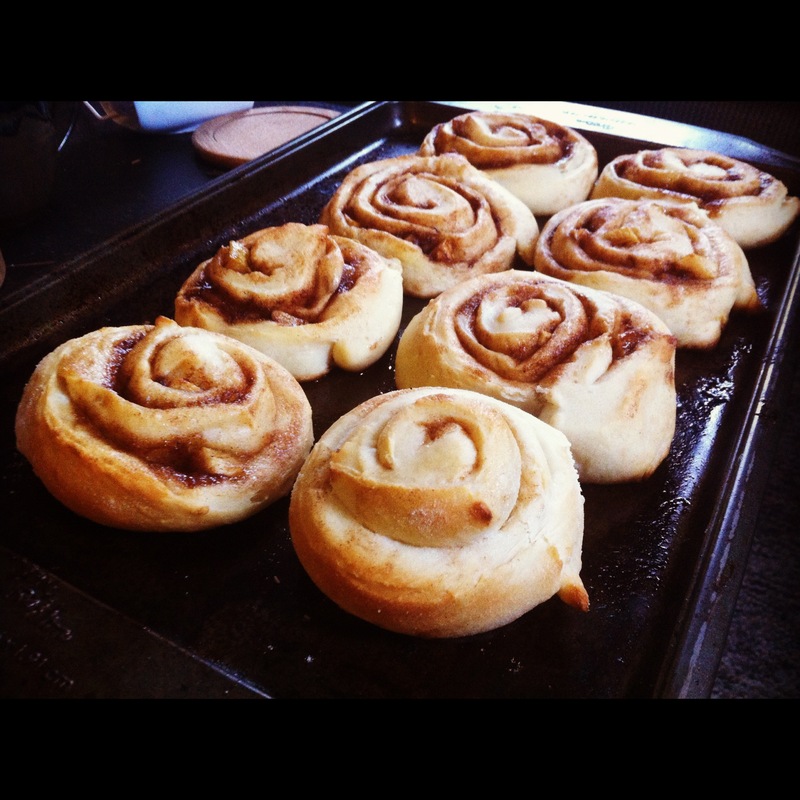 I’m back with another cinnamon roll recipe perfect for the holiday baking season. This pastry was born when I had too much filling leftover after I baked an apple pie. Am I the only one who always has leftover filling? Anyway, they turned out beautifully with the tartness of the apples adding some nice complexity to the usual simple sweetness of cinnamon rolls. Bring these to an office potluck or serve them for breakfast on Christmas morning and be everybody’s new best friend. Prepare the filling: Toss apple chunks with the canola oil and maple syrup. Cream brown sugar, earth balance, and spices together in a small bowl until well combined. Add the apple mixture to the brown sugar mixture and toss to coat apples. Preheat your oven to 400 F and lightly grease a heavy cookie sheet. 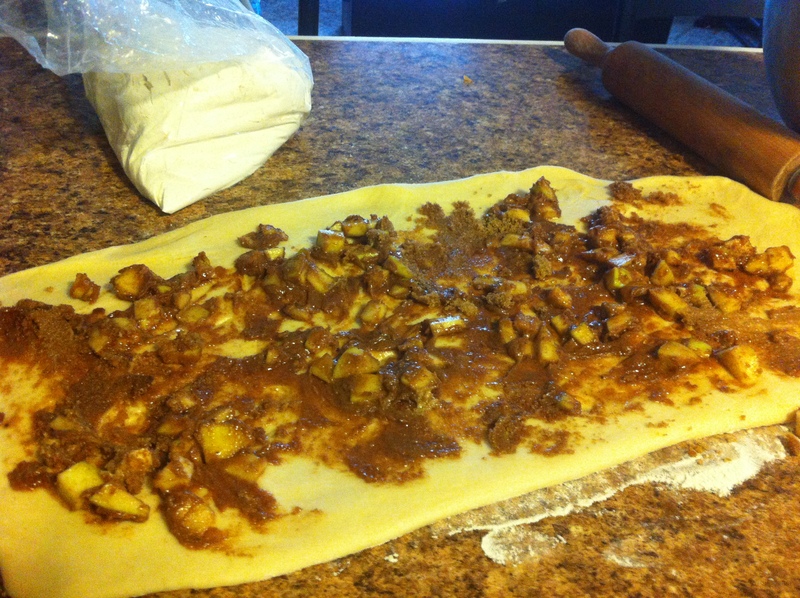 Punch down the prepared dough onto a floured surface and roll into a 15 x 9 inch rectangle. Drop the filling into the center of the rectangle. Use the back of a spoon to spread the filling evenly over the surface of the dough, leaving 1 inch “margins” around the perimeter. Roll dough into a cylinder lengthwise and slice into 12 pieces. Place evenly on the prepared cookie sheet and let rise for an additional 15 – 20 minutes. Cover and place in the fridge until ready to bake, or progress immediately to the baking step if you want them right away! Bake for 12 – 15 minutes until lightly browned on the bottom. Drizzle your favorite icing over the rolls while they’re still warm, if you like, but I prefer them in their naked state. These are best served immediately, but keep well for a couple of days stored in an airtight container.